Rodney Atkins is still just a country boy. 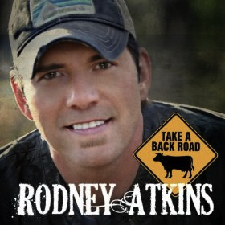 It’s been an interesting couple years for Rodney Atkins. After running off five number one hits during 2006 through 2008 Rodney saw a couple singles struggle on the charts in 2009. Then last year he came back with the top five hit Farmer’s Daughter . The song saw Rodney getting back to his good ol’ boy roots a bit. Now it’s 2011 and Rodney is back with a fresh new single and it’s right up the alley of his fanbase. Check out Take A Back Road . The first thing that catches my attention on this song is the melody. There is a bit of a laid back groove fronted by an electric guitar. Then Rodney comes in with his classic awe shucks vocals. It all makes for a fun song about taking a drive around the back roads of rural America. Now I live in Chippewa Falls, WI population of about 15,000. It’s not exactly a metropolis so there isn’t much traffic, but even around here I get frustrated with traffic in the more city-type places. I need the backroads where I can take my time and enjoy the surroundings without having to worry about too many other people. Take A Back Road captures what it feels like to drive the back roads in America on a lazy Sunday afternoon in rural America. You grab your girl and head out for a drive. You put your left wrist across the top of the steering wheel. You roll the windows down (yes roll the windows down on that truck) and put your arm around her. Just take a drive and enjoy what America is all about. This sounds like the perfect song for today’s country radio. It’s good to have Rodney back on the top of the charts with good songs. His career has had some crazy ups and downs since his first release in 1997. Now he’s sure to be back on top in 2011. This just in…Rodney’s in the studio!